The C.O.O.K. Alliance is the leading voice for home food entrepreneurs in the United States. Our groundbreaking 2018 home cooking legislation (AB 626) created a “Microenterprise Home Kitchen” permit in California— the first of its kind in the nation. As a result, California counties may begin permitting home cooks to sell all types of prepared foods to the public beginning January 1, 2019. We expect many other states to quickly follow California’s lead. The home cooked food revolution is just beginning. We are raising a $350k “launch fund” and would love for you to join us. $50k: Create online permitting and legal assistance tool for home cooks to quickly access new permits. Work with partners to elevate diverse cook stories and build awareness in underserved communities. $250k: Launch Policy Leadership Program with model legislation and advocacy toolkits to support allied groups in other states. Develop local government partnerships to support with implementation. $350k: Begin assisting cooks with micro-loans, liability insurance, and other business services through vetted partners (including online selling tools). Launch accessible, multi-lingual community workshops and outreach events. Most food jobs are low-quality: The food industry is highly segregated by race and gender, with quality work out of reach for many. Minimum wage jobs are now under added threat from automation. Public health is suffering: Most food companies serve only profitable customers and geographies, leaving marginalized communities in food deserts without access to healthy or affordable options. Barriers to entrepreneurship are high: A food truck in the U.S. costs $50k+, while brick and mortar spaces cost $300k+. Even renting shared kitchen space (at $25+/hour) can be prohibitively expense. Cooks selling any amount of food from home without a permit can face criminal charges, fines, and even jail time. Food and labor justice advocates are often stuck “innovating at the edges,” without addressing underlying inequities. “I have always cooked for a large family, school fundraisers, and holiday parties. My friends were always asking if they could buy extra portions of my food, so I decided to sell food occasionally on a homemade food Facebook group in Stockton. It wasn’t always about making money—I would often trade my food with other members or at times just give food away to a family in need.This was a great way to get to know my neighbors and to be around as a positive entrepreneur role model for my kids. Over 100,000 Californians currently earn money selling home cooked food without legal status to operate. This informal food economy has historically been 85% women, 50% people of color, and 35% immigrants. For many, home cooking is the most viable way to make a living within financial and life constraints. At the same time, nearly 25 million Americans live in food deserts without easy access to fresh, affordable food. Home cooks want to legitimize their work. With a Microenterprise Home Kitchen permit, cooks can legally earn extra income for their families or incubate a larger food business, with an upfront cost of under $1000. In this context, home cooking offers a radical empowerment opportunity. Home cooking creates economic self-sufficiency, increases healthy food access, and builds empathy among neighbors. Cooks nourish our communities in the most holistic sense, and deserve to be recognized and compensated for their work. “I wasn’t working because I had broken my hand. Home cooking helped me make rent and saved me from slipping deep into depression. I’m the type that when I’m still and quiet, it’s boring. I have to be doing something. It’s allowed me to have fun doing what I love which is preparing meals for people. Training: We are developing the first online food entrepreneurship training program for home cooks, which will include permitting and legal assistance. We plan to offer accessible community workshops, support services, and online tools. Resources: We will also facilitate access to micro-loans, liability insurance, and other business services needed to empower working families and aspiring food entrepreneurs. Nationally: After co-drafting and sponsoring The Homemade Food Operations Act in California, we’re creating model legislation and advocacy toolkits to support allied groups in other states. Locally: We are working with counties to support implementation of AB 626 across California. “I grew up in Saigon, Vietnam, cooking in the restaurant my grandmother ran for over 60 years. When I moved to the United States, I missed cooking these foods and wanted to share Vietnamese cuisine with my new community. While my husband and I explored small business development programs and received lots of great advice about starting a business, the prohibitive cost of operating out of a commercial kitchen or a brick-and-mortar restaurant led us to start cooking out of our home. We are not starting from scratch. Our works sits at the intersection of growing movements to address the failings of our food system. In the past decade, forty-nine states have passed narrow Cottage Food Laws (primarily limited to nonperishable foods). Many cities are expanding food truck and shared kitchen programs. Communities and governments are both grappling with the promise and perils of internet-enabled “sharing economies.” However, existing efforts are falling short and home cooking fills an home cooking fills an important gap, bringing the barrier to entry in the food system to an all-time low. 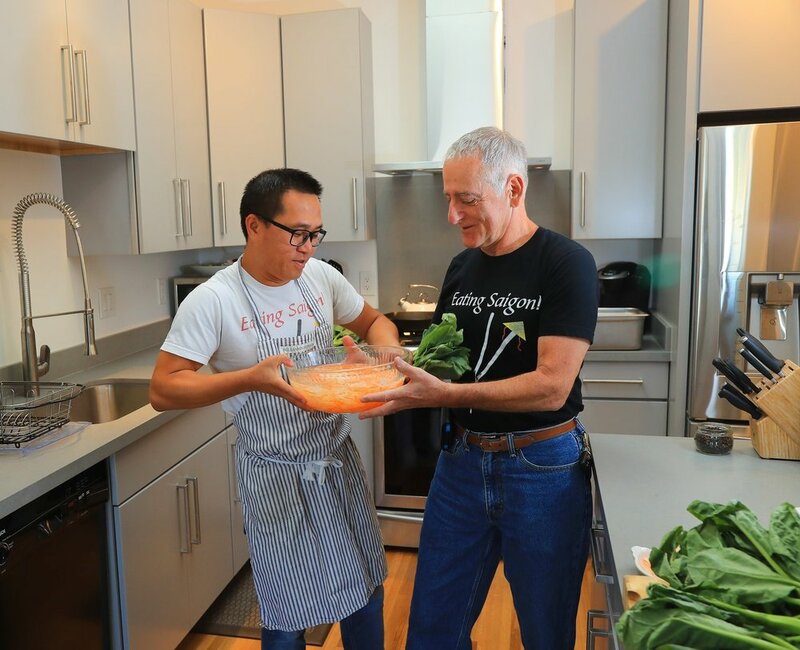 We will continue to connect the dots between kitchen incubators and small business advocates, food lawyers and urban farmers, labor organizers and elected officials, in service of home cooks and their communities. Matt Jorgensen (Coordinator): Matt is a Social Innovation Fellow at the National Domestic Worker's Alliance and the former Cofounder and Co-CEO of social enterprise home cooking platform Josephine. In a past life, he consulted for Bain & Company and founded an ethical apparel company. Liz Allen, J.D. (Policy Director): Liz is a legislative lawyer. She has written and helped pass laws in CA, CO, and WA states. Her previous experience includes the Washington State Senate, the Washington Supreme Court, the ACLU and as an Urban Leaders Fellow. We are deeply committed to staying accountable to as many stakeholders as possible. Our Board Members represent a diverse cross-section of these stakeholders and provide accountability for our strategic direction. Please visit www.cookalliance.org or email advocacy@cookalliance.org to learn more.